ERFC is proud to offer football for girls, boys, women and men of all ages, from our talented and experienced elite players to those who are 'new to the game'. To find out more about our programs, select your area of interest below. IMPORTANT: Download the Information Sheet & Registration Guide: Saturday Program_Spiderlings_3,4yr olds_2019 ***Registrations are tricky for this age group due to the Play Football site - please follow the registration guide carefully and email us if you have any questions. Our Spiderlings program is an entry level sports program for 3 (Born 2016) and 4 (Born 2015) year old boys and girls. Run at the same time as our Saturday Small Sided Football sessions for U5s to U7s, this program was spawned as a result of the many parent requests for younger siblings to have a program. 2011 saw the launch of the program and it has gone from strength to strength since. This season, 60 children are taking part. Designed and conducted by an experienced coach (Coach Michael from Healthy Aussie Kids), Spiderlings' emphasis is on active, fun play while developing co-ordination and fundamental motor skills. The program also introduces children to formal, structured sports. Indeed, many of our Spiderlings graduate to Saturday Small Sided Football when they are old enough. Spiderlings consists of a 30 minute session held on Saturday mornings during the football season. Though it is run by Coach Michael, occasional parent involvement is required. Groups are limited to 15 children. Children in this age group receive a Redbacks playing top but are not required wear shin pads or boots. Program commences April and June each year. Based on previous years, this program is very popular and sells out quickly, so it is suggested you register early to secure your spot. Note a credit card fee of 1.8% is charged by Football Australia, not the club. We continue to provide feedback to Football Australia about the size of this fee but regrettably Football Australia has not changed it. We are holding a REGISTRATION MORNING for our popular Saturday Program for 3-7 year olds. 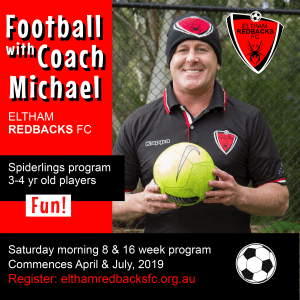 Come down and chat to our coordinators, we can help you register (as the online system is a bit tricky) and then your child will receive their official Eltham Redbacks playing kit! We will be set on on the synthetic pitch – come see us! 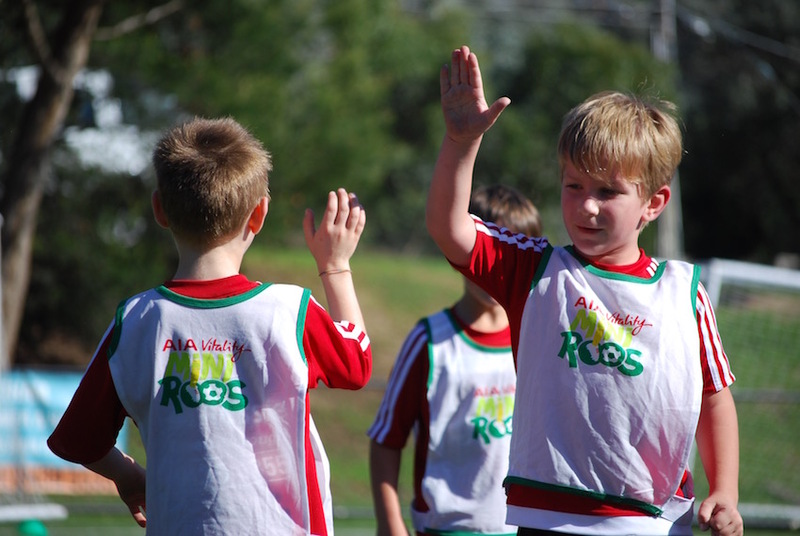 Our Saturday Small Sided Football Program is designed for children turning 5, 6 or 7 during the calendar year. The aim of the program is two-fold – for your children to have a wonderful time learning the basics of the “beautiful game” and to become accustomed to a structured sporting environment. The sessions consists of a “skills” component and a “game” component. Designed with the FA National Curriculum in mind, we begin our session with a 30 minute component of fun games that focus on a particular skill. These change from week to week and are appropriate for the age group. Following the skills session, we play a small sided football game for 30 minutes. At this age level the format is a one-eighth sized pitch and 4v4 or 5v5with no goal keeper. The games are low key but it is during this controlled competitive environment that our players can put into practice the skills they have been learning. To facilitate the program, our main synthetic pitch is divided into 8 small grounds with small goals. On each pitch we run groups of 10 children. Each group is coached by a parent coach who receives training and guidance from our accredited coaching director. The groups (in most cases) are all similar ages but we do move exceptional children to ensure their football experience is a positive one. The program also produces a secondary benefit – for you as parents to be introduced to club sport and the Redbacks club culture. It is important for new parents to understand that the club is fundamentally volunteer run and our greatest strength is the breadth and depth of the fantastic volunteers who coach, organise and administer our club. This program is very popular and the 140 places have sold out each year since 2012, so it is suggested you register early to secure your spot. Times in 2019 *Due to parent feedback - girls & boys play in separate teams. Cost: $425 - includes playing strip (jacket, top, shorts, socks), FFV affiliation fee, FFV team nomination fee, FFA player registration fee, training facilities rental, season trophies, coaching fees, canteen staff, junior admin fees, all training equipment (balls, cones, bibs etc.) and a building levy of $20 for the redevelopment of our clubrooms. This is the only fee you will pay for the whole season. 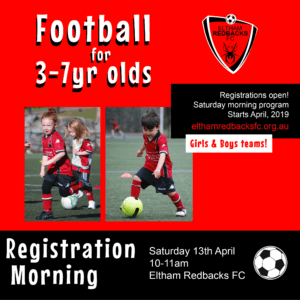 At Eltham Redbacks FC we appreciate that the future of our club starts with the earliest age groups and we have invested heavily in developing a strong football program for our young members. Small Sided Football is played up to the U12 age group (children turning 12 during the calendar year) with full-size games beginning at U13. The objective of small sided football is to maximise the amount of time each child has ‘on the ball’ and thus promote enjoyment and skill development. Games are played on Sunday (usually early) with a home and away fixture. There is no official “ladder” until the U12s as the emphasis is on player development and not on winning. ERFC places exacting standards on all our coaches. Every coach is appropriately qualified with overall guidance provided by our highly credentialed Head Coaches. The football season commences in April and runs through to September. Trials for these age groups are critical as they help us place players in a team that is appropriate to their level of ability. Details about the trialling process including trial dates are released well ahead of the season. This program is very popular and sells out quickly, so it is suggested you register early to secure your spot. Check our registration page for more information about how to register. At the U8 and U9 age groups, teams of 7 children (6 + goalkeeper) play on a quarter pitch with modified goals. Players are graded according to their ability (Kangaroos, Wallabies & Joeys) to provide the best chance for individual growth. A home and away competition is played on Sunday morning with results not being recorded. In 2018 ERFC fielded multiple teams (including girls teams in separate girls competitions) each with a squad size of roughly 10. Training took place on a Monday and Wednesday evenings. At the U10, U11 and U12 age groups, teams of 9 children (8 + goalkeeper) play on a half pitch with modified goals. Players are graded according to their ability (Kangaroos, Wallabies & Joeys) to provide the best chance for individual growth. A home and away competition is played on Sunday morning. In 2018 ERFC fielded multiple teams (including girls teams in separate girls competitions) each with a squad size of 12. Training took place on a Monday and Wednesday evening. 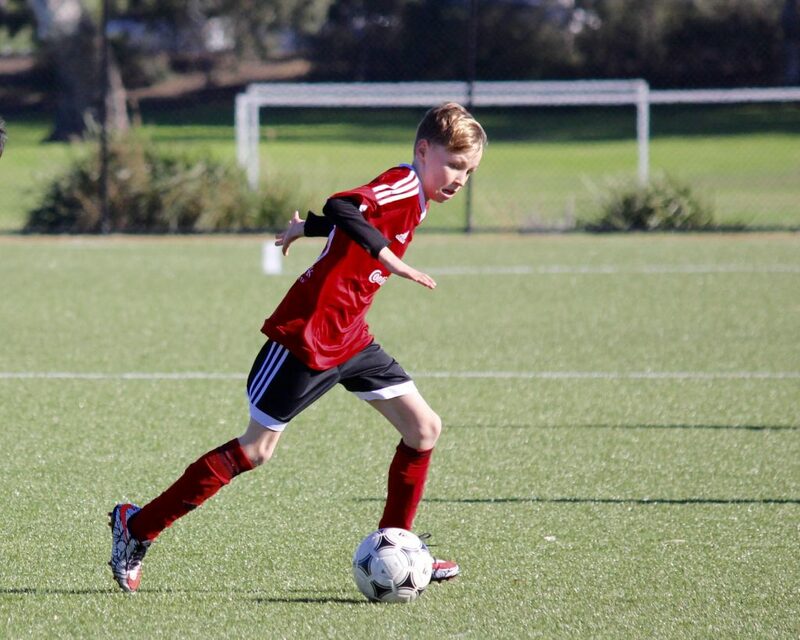 Eltham Redbacks FC takes great pride in our junior (U13-U18) program and believes it offers the best value for money in the region. The program is the culmination in years of hard work, constant fine tuning and significant expansion in the financial commitment to our juniors’ development and our results in leagues at all levels and ages is reflective of our progress. Our program is overseen by our highly credentialed Head Coaches. All of our team coaches are qualified through FV’s accredited courses and follow our football curriculum which is based around FA’s National Curriculum. 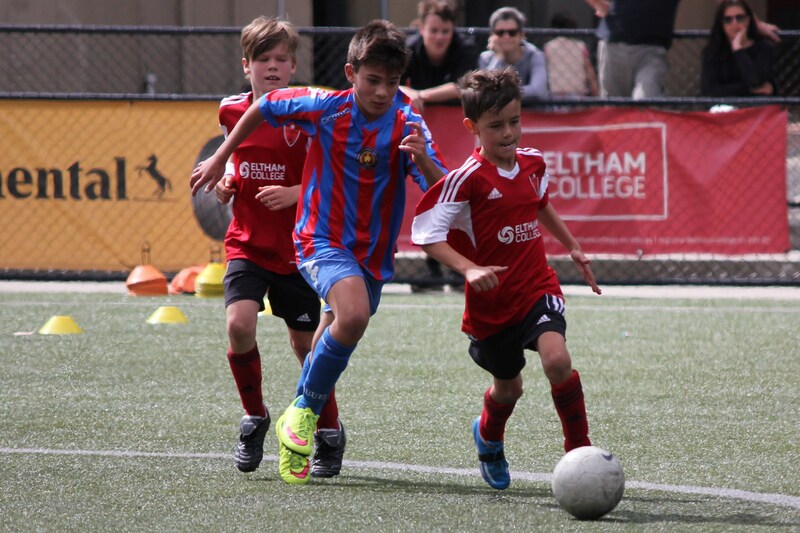 At Eltham the focus is always on player education and growth in ability. We aim to develop players who draw on technical ability rather than size, strength or speed to beat an opponent. From this, the results will come. The football season commences in April and runs through to September. This program is very popular and limited places are available, so it is suggested you register early to secure your spot. Players must also attend trials in order to be selected. Trials for these age groups are critical as they help us place players in a team that is appropriate to their level of ability. Details about the trialling process including trial dates are released well ahead of the season. Check our registration page for more information about how to register. 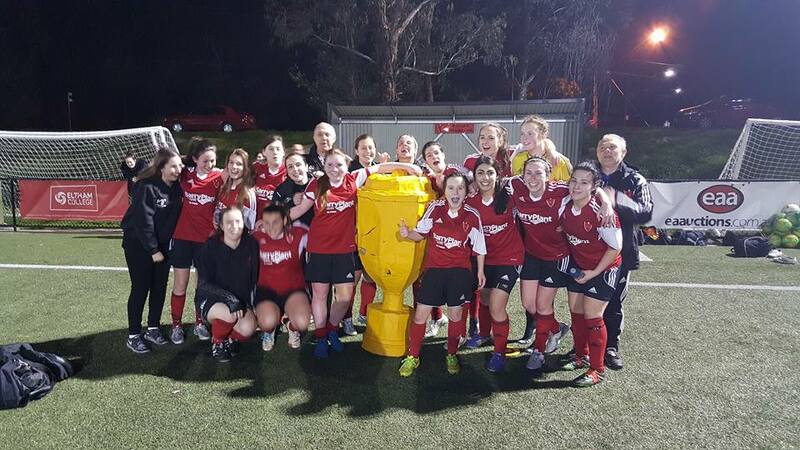 Our Senior Women were crowned champions of State League 2 in 2015, gaining promotion to State League 1 in 2016. 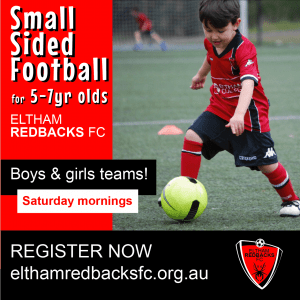 Eltham Redbacks provide an inclusive, team-focused environment and would love to hear from you! 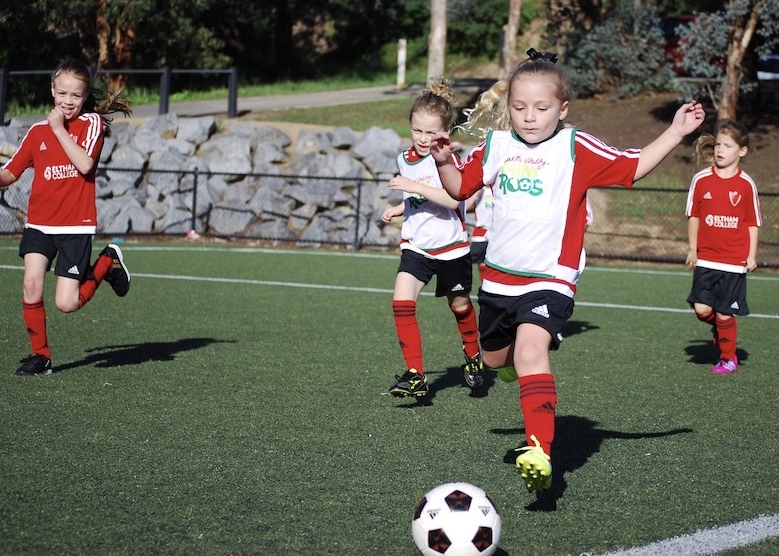 Football (soccer) is one of the top three team sports played by girls and women throughout Australia and Eltham Redbacks are proud to have the biggest girls/women’s program in the North East region of Victoria. This means we have teams that cater for all ages and playing abilities with quality accredited coaches who are enthusiastic and committed. The coaches work in conjunction with the Redback’s Technical Director to administer the club’s football program which is based on the Football Federation of Australia (FFA) curriculum. This provides players with the support and resources to ensure they develop their skills, regardless of ability. The Senior Women’s program currently comprises three teams playing in the Football Federation Victoria (FFV) State League 1 & Reserves (mainly U20 players) and State League 3 competitions respectively. The competition format sports an official home and away season between April and September each year. Annually, the teams and Club support Pink Ribbon Day raising funds for breast cancer research and awareness by dedicating a home game to this worthwhile cause. Donning their customary pink ribbon uniform for the match and organising a few stalls, the women have raised in excess of $7,000 combined over several years and this local event continues to make an important contribution to the Cancer Council. Our State League 1 women play in a highly competitive league full of experienced players that want their skill and ability tested on a weekly basis. The team train strongly and are committed to bringing the best out of themselves as they represent the club. This team was promoted from State League 2 at the end of season 2015. The team is complemented by our Reserves, an U20s development squad competing in a strong competition against similarly skilled young women. The team has a strong focus on developing and promoting youth with talent and is a launching pad to the State League 1 team. State League 1 and Reserves train on Monday and Wednesday nights 7.00pm to 8.30pm. All home games are played on a Friday night at the club, while away games are played Sundays. Our State League 3 Women's team is one that encourages and supports newer players wanting to feel a part of a team, with a focus on being competitive in a social and fun environment. If you are interested in joining one of these teams, please contact us via the contact form. After winning three league titles (2014, 2016 and 2017) and achieving four consecutive promotions (2014-2017), our Senior Men will now compete in State League 2. First team (State League 1 South/ East) – Coached by Paul Harris with assistance from Ryan Ollerton. This squad is for talented and committed players who wish to play in a highly competitive league against other high level teams. 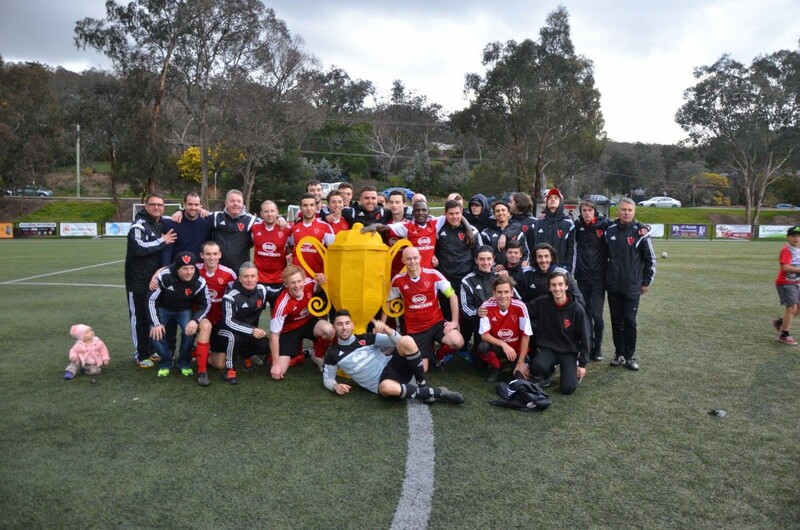 Reserves team (State League 1 South/ East Reserves) – Coached by Chris Mitrevski and largely made up of players under the age of 21. The team has a strong focus on developing and promoting youth with talent and is a launching pad to the State 1 team. Metropolitan League 3 North-West – Coached by Gary Frost and largely made up of players with previous playing experience. This team competes in a tough but social league. Metropolitan League 5 North-West – Coached by Rob Kovac and suited to players of all ages looking for a relaxed and friendly set up. If you are interested in joining one of these teams or have any questions, please don’t hesitate to contact us via this contact form. Big Kidz is a social 'kick about' for Over 35s who are not interested in playing in a full weekly FFV competition. 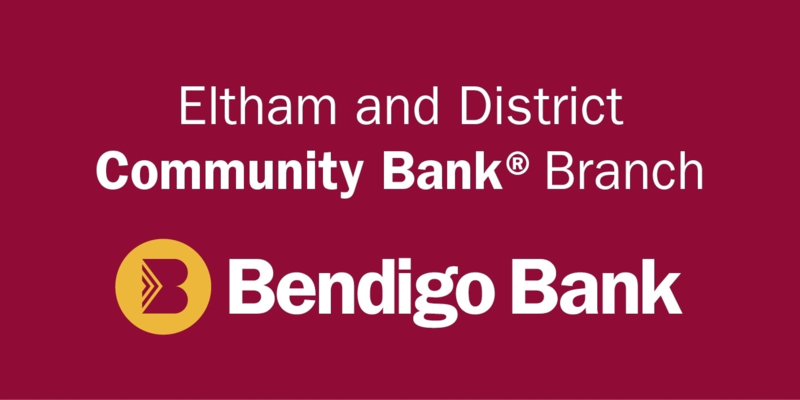 The program involves only Eltham Redbacks members and continues all year round. It is a terrific way for Mums and Dads to maintain fitness and technique while life is too busy for any thing more. Please use the website contact form to get in touch with any related inquiries. 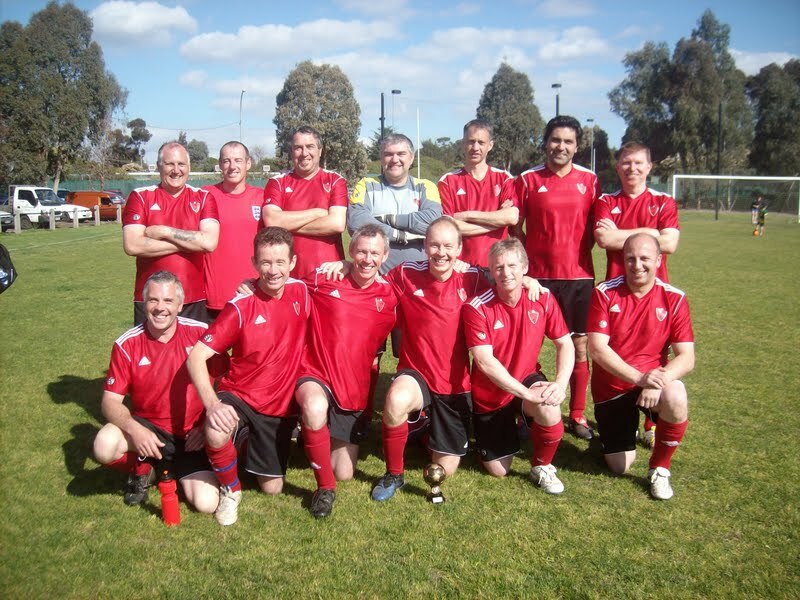 For the last 5 years, Eltham Redbacks FC has run it's own Over 45s league that encourages older men (40 – 60) to engage in an appropriate, semi-competitive football program with a health and well-being focus. The league has proven to be very popular and has helped men of all ages get back into football and fitness. Uniform: Full uniform supplied. Boots and shin-pads need to be purchased. If you are interested in joining one of these teams or have any questions, please don’t hesitate to email the club secretary via the contact form. 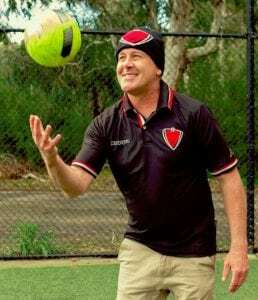 In 2019, Eltham Redbacks is launching Lottery League Football, a brand-new kind of football for all players from the Men’s Over 45’s league, BigKidz program and parents/grandparents of members who don’t want to play competitively anymore. 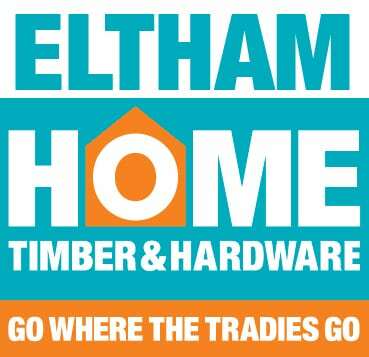 If this is successful we intend developing the idea for any mothers/grandmothers who would like to keep active and play in a women’s Lottery League, so if you are an interested mum or grand mum contact Bob and he will pass your details onto the ERFC Football Department. What is Lottery League and how is it different to normal leagues? Lottery League Football is a new flexible, friendly and social way to play football that is open to everyone over 45. There is no maximum age limit and anyone from 45 up is welcome. Anyone who has previously retired due to the pace of the O45s league, or doesn’t play even socially anymore, is welcome to come back and put their boots on again! We are also looking to entice back any players in their 50s, 60s and beyond, as there is no age limit with this. If you want to come back and play out your remaining years in a fun and relaxed environment, then this is it! At the start of the season, all players in the pool are allocated a player number – you keep that number all season. Prior to each game, all players’ numbers will be placed in a hat and the first 11 to be drawn out will be a team for that week and will play a team formed by the remaining players not drawn out. Note there is a reference here to 11 players but if 28 players turn up we will pick the first 14 out of the hat to form a team. In this manner, we do not want any players on benches anymore, so no substitutes on lines, etc. If anyone wants a rest they are welcome to bring themselves off until they have recovered. Players who win a game are awarded 1 point, those who lose get zero, and a draw also means zero for everyone. The team that wins the Lottery League at the end of the season will be the 11 players who have amassed the most wins. The Lottery League table will be kept secret until season-end to keep the interest alive. A small trophy will be awarded to the winning team (11 players) that records the most wins during the season. The Lottery League is being set up to break down “team mentality” (us and them) and encourages everyone to play with everyone else week after week. The aim is to foster more social friendships in the club. Rules are effectively the same as normal football but to remove any contentious incidents there is no offside – this is all about having fun and being on the park. Players can either throw or kick the ball in and there are no foul throws. Depending on numbers, the club will run one midweek session and one weekend session every week. Times to be confirmed. The price for the full season is just $130. Registration will take place through the Play Football portal. We want cost-effective and enjoyable football, so players are asked to bring their own kit, boots and shin guards (including a white and dark top each week for team sorting). This will keep costs down as there will be no annual kit costs and no referee costs as this is non-competitive football. The club will provide the balls, the pitch and the lights. Lottery League is all about having fun, playing on at football for as long as you can, and the opportunity for all players to mix together and bond in a social environment both on the pitch and in the clubhouse. No bad attitudes will be tolerated – we want all players to have a great time, no white line fever and just enjoy it! We look forward to launching Lottery League in 2019 so that all players can play out the rest of their football careers in an enjoyable, safe and friendly environment together.